In recent months the U.S. brokerage market has ridden a cycle of highs and lows, sometimes at the same time. Whereas in October sales volume was at the highest level for the month since 2007, sales fell in November and were the lowest since 2008. Yet as powerboat sales cooled, the smaller segment of sailboat sales rallied. 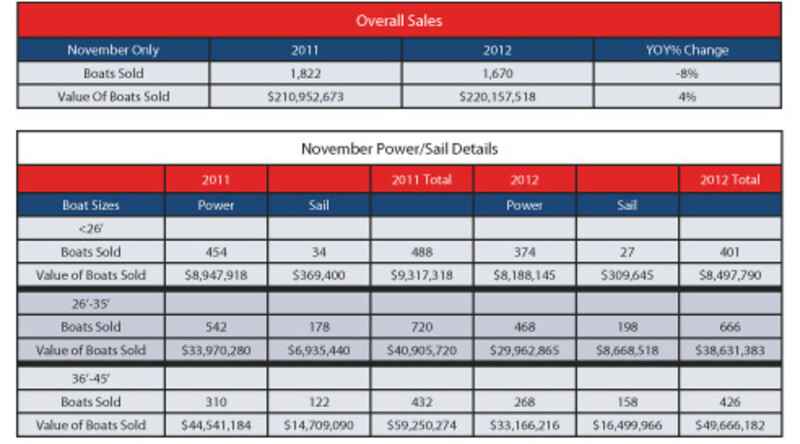 As reported by YachtWorld member brokerages in their proprietary database, Soldboats.com, 1,670 boats were sold in November, down from 1,822 in November 2011. The number of powerboats changing hands, 1,257, was down 200 from November 2011; the number of sailboats sold rose from 365 to 413. Generally speaking, sales were lower among smaller boats. The under-26-foot category was the hardest hit, with 401 boats sold, a decline of 87 boats from a year earlier. Very few sailboats were sold — 34 in 2011, 27 in 2012 — so nearly all of the decline was attributable to lower powerboat sales. A different story occurred in the 26- to 35-foot category, where brokers reported 666 transactions — 468 powerboats and 198 sailboats. Those figures represented a decline of 74 powerboat transactions, offset partially by 20 additional sailboats changing hands. Sales were up even more strongly for sailboats in the 36- to 45-foot range, with 158 closing, up from 122 the year before. Again in this category, powerboat sales fell, dropping from 310 in 2011 to 268 in 2012. The total price paid for brokerage boats sold in November was $220 million, so even as total sales declined the total valuation increased by $9 million, or 4 percent, from the previous year. The gains were largely a result of higher prices in the sales of boats over 56 feet. For the year through November U.S. brokerages reported 3 percent higher sales, with 27,941 boats sold. They seem likely to finish the year with a total number of transactions between 29,000 and 30,000. The aggregate value of the boats sold declined by 7 percent, from $3.1 billion to $2.9 billion. Powerboat sales, which were higher earlier in the year, remained up 3 percent from 2011 with 22,811 boats sold. Sailboat sales, with a small surge in the past couple of months, were up 1 percent, with 5,130 boats sold.